If everybody’s doing it, that makes it OK. Well, no. But that does make it a cultural universal—the anthropological name for something done, in some form or other, by every human culture around the world. This includes language, religion, music, art, marriage, war, families, gender roles, laws, taboos, personal names, etiquette, morals, etc. The cultural universal can be somewhat of a pain for evolutionists to try to explain. In a world where societies are supposed to have migrated, evolved, changed, developed and faced various extinctions separately, how can it be that every culture does these things? This third cultural universal installment is on the subject of clothing. Some may instantly doubt this as universal, though, recalling naked tribal races throughout parts of Africa and South America. This will be explained below, and paired up with another related subject, which is in itself a cultural universal. 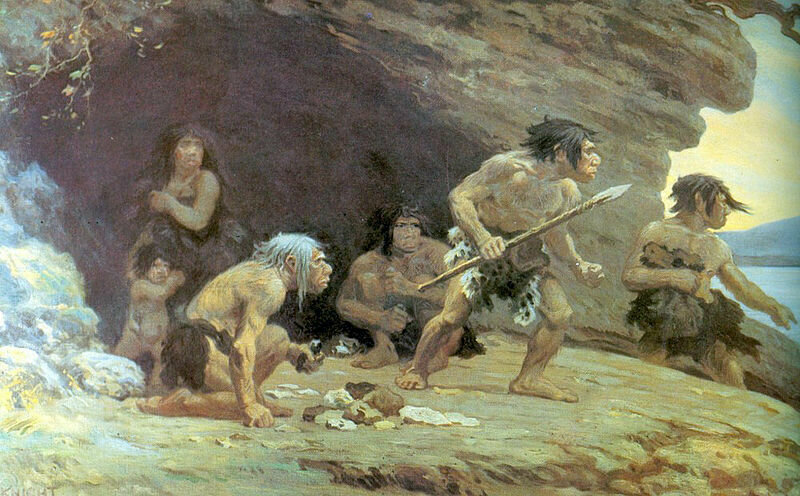 Have you ever wondered when humans started wearing clothing? Why do only humans wear clothing—separate from every creature in the animal kingdom? How do anthropologists explain it, according to evolutionary processes, and what does the Bible say? How do these explanations square with archaeological discoveries? Is clothing really a cultural universal? Indeed, certain primitive tribal people wear next-to-nothing. Butthere are no entirely naked cultures. (Of course, there are degenerate “nudist” groups, but these part-time deviants do not represent lifelong cultures.) Across all cultures, at least some form of “clothing” is used, generally with an association of shame upon its wrongful removal, be it from a piece of string to a burka (but more generally across society, clothing at least covering the sexual organs). Which brings us to the second, related cultural universal—shame. Shame is witnessed in cultures around the world. Shame—along with the related emotion of embarrassment—has a direct connection with clothing and being indecently exposed. As such, we will discuss both in this article. This one is quite tricky to explain for evolutionists, because one must first explain why we are such “naked” creatures to begin with. Our great ape “cousins” are covered in a relatively thick coat of hair all over their bodies. Why did humans become so “hairless”—and yet how did we somehow retain the decorative hair around our heads and other “random” patches of thick hair such as our armpits? From hairy to hairless? The evolutionary journey. Evolutionists have dissenting opinions on this. Some believe that we became hairless due to temperatures becoming so hot as to not need fur (despite the fact that monkeys and apes generally live in warmer environments than humans—and despite the fact that the “hairiest” humans today live in the Mediterranean and Middle East, some of our warmest environments). It is estimated that we started shedding our body hair around 2 million years ago, and that this aided long-distance hunting in warmer environments. Others believe that we went back to being partial water-dwelling creatures before finally evolving into humans. Still others believe that there was a “trade-off” effect—that it was a toss-up between having more hair and more parasites, or less hair and less parasites. We “chose” the latter route. None of these provide an explanation, though, for the decorative head/facial hair and hair on other parts of the body. One theory for this is sexual selection—preference for humans exhibiting such body hair. Again, though, this would already have had to somehow evolve, in order for it to then be selected. Regarding the exclusively human endeavor of clothing—it is estimated that humans began putting skin-to-cloth sometime between 500,000 and 100,000 years ago. Some support for this time frame is taken by pointing to the human body louse, which lives in clothing. This louse is believed to have evolved separately from the head louse around 200,000 years ago, thus one “sign” (albeit a theoretical one) of our transitioning to wearing clothes. It is believed that the first items of clothing were made from either vegetation or animal skins, and they were designed as protection from weather conditions. Other theories claim that clothing was first used for ritual or decoration before being adopted as a protective measure. It’s interesting that, according to these theories, mankind only began wearing clothing about 1.5 million years after he started shedding his fur. That’s a long time to go starkers, before realizing insulation or protection might have been a good idea after all. And as for shame? In the “grand” scheme of evolution, shame seems to be a moot point, besides the development of various physical organs and apparatuses. But actually, shame—and the related emotion of blushing—has been a big problem for evolutionists. As Charles Darwin wrote: “Blushing is the most peculiar and the most human of all expressions. Monkeys redden from passion, but it would require an overwhelming amount of evidence to make us believe that any animal could blush.” Blushing has even been called the “biggest gap in evolutionary theory.” Best guesses thus far state that perhaps the “early blushers” were naturally selected because they showed a greater degree of respect for honesty, something important for functioning in a group environment. Yet the question remains, how did the first humans begin blushing in order for it to be naturally selected? And to theorize that blushing was a naturally selected trait that revealed honesty is one thing, but what about blushing out of shame, and how did we even come to have a general sense of shame—especially related to clothing, and indecent exposure? Again, no real answers, only guesses. The Bible, of course, is very clear and up-front about the development of both clothing and shame. Genesis 2:25 reads: “And they [Adam and Eve] were both naked, the man and his wife, and were not ashamed.” The first man and woman were not created with clothing, nor with shame (at least not with regard to their nakedness). The Bible describes the human body as “fearfully and wonderfully made,” not something that is shameful. In Genesis 3, however, things changed. In Genesis 3, Satan the devil, disguised as a serpent, deceived Eve into taking of the tree of the knowledge of good and evil—choosing his way of life rather than God’s way, symbolized by the tree of life. Adam followed his wife, and mankind (except for a minute few) has been cut off from God ever since (Genesis 2:22-24—see our booklet here for more information on this subject). One of the first effects of their decision to eat from the forbidden tree was an immediate sense of shame. “And the eyes of them both were opened, and they knew that they were naked; and they sewed fig leaves together, and made themselves aprons” (Genesis 3:7). This was the first ramshackle assemblage of “clothing”—not for warmth, ritual or decoration, but for shame. The word “apron” can be translated as “belt” or “loincloth.” Adam told God, “I was afraid, because I was naked; and I hid myself” (verse 10). And Adam called his wife’s name Eve; because she was the mother of all living. Unto Adam also and to his wife did the Lord God make coats of skins, and clothed them. God created the first items of clothing out of animal skins. But why? Did He decide that Adam and Eve were right—that the human body was shameful and thus needed to be concealed? Certainly not. Actually, both of these verses can be considered as a parenthetical thought. God made Adam and Eve coats of skins—why?—because as verse 20 says, Eve became the “mother of all living.” The entrance of other human beings into the world necessitated the more intimate body parts to be covered, not flaunted in public, not to be indecently exposed outside of the marriage union. Later verses in the Bible thoroughly describe God’s condemnation of indecent exposure outside of marriage (e.g. Leviticus 18; also see Genesis 9:23). It is worth noting that God made Adam and Eve coats of skins—also translated as long tunics—these certainly were not skimpy items, like the vegetation “belts” Adam and Eve had made. They were longer, more appropriate coverings (particularly for Eve). So the Bible is very clear. The first couple started off naked. Shame—related to nakedness—entered after the original sin. Clothing of vegetation was first used in order to cover up the “shame.” Later, God created clothing of animal skins, as other humans began to enter the equation. Man subsequently began wearing animal skins and afterward began developing different fibers, turning into the various types of early apparel described later in the Bible. What does archaeology have to say on the development of clothing? The earliest “evidence” of clothing comes in the form of sewing needles found in a cave in Russia. These have been dated as roughly 40,000 years old. Flax fibers have been found and dated to 36,000 years old. The Venus of Lespugue figurine from southern France, dated at c. 25,000 years old, is depicted wearing a skirt (though most early Venus statues are depicted as being naked—naturally, as fertility idols). I take issue with these dates given. Several in the scientific community do the same. This article doesn’t have the space for a full explanation (perhaps another article on this subject will be forthcoming). But I fully believe these dates are far older than they should be. Put simply: Dating methods, such as carbon dating, uranium dating and samarium dating, are not reliable. That’s because these dating methods are based on the assumption that the Earth is, and always has been, operating under a “fixed system.” That the rate of radioactive decay in a given item is, and has always been, the same—thus precisely measurable and able to give us “precise” dates as far back as millennia ago. Actually, scientific research has been proving that this assumption is not just slightly, but utterly, wrong. Regular-occurring solar flares, as well as fluctuations in the Earth’s magnetic field, have been shown to directly and significantly affect rates of decay. Even simple changes in the seasons have been shown to change decay rates. And the testing of nuclear weapons over the past 80 years has caused serious issues with properly reading radiocarbon dates due do even minuscule amounts of radiation particles spreading all over the Earth’s atmosphere. Generally, these issues raised have had no significant response from the broader scientific community with regard to dating methods. Isotopic dating is the much-cherished baby of evolutionary scientists. Certain measures have been undertaken to correct the error, such as revamping dates found to be 10,000+ years off to throwing out some dates entirely. Still, radioisotope dating is often way off, generally providing far older dates. Such as this example of a Himalayan geological event that was given a date 1,900 percent greater than that found by later research (an especially significant discrepancy, when the date is in the realm of millions of years ago). And for those who believe Earth hasn’t been a stable, fixed system for millions of years—which science shows that it hasn’t—i.e., those who believe in a great Flood that occurred c. 4,500 years ago—then any dates given earlier than this can be considered as significantly exaggerated. If you’d like to research more on this subject, take a look at these articles here, here, here and here. If, according to the evolutionary theory, man has been clothing himself in some form or other from about 500,000 years ago onward, the fact that the earliest material “evidence” for clothing is dated only to about 40,000 years ago seems unusual (setting aside the case that even this date is greatly exaggerated). The first actual clothing textiles that have been discovered are dated to around 6500 b.c.e., including a form of knitting. (Again, consider the above paragraphs. Still, typically the younger the dates are, the closer to accurate they become.) Scientists date silk and cotton as appearing c. 4000 b.c.e. The Bible highlights the importance of retaining a separation between male and female dress (Deuteronomy 22:5). These differences in dress between the sexes are clearly shown in ancient art (although, as this scripture implies, transvestite practices existed throughout the region, particularly in pagan religious ceremonies). Abraham and his family, who emerged from the Babylonian city of Ur, would have dressed in the modest Mesopotamian fashion, taking the style with him to the land of Canaan. 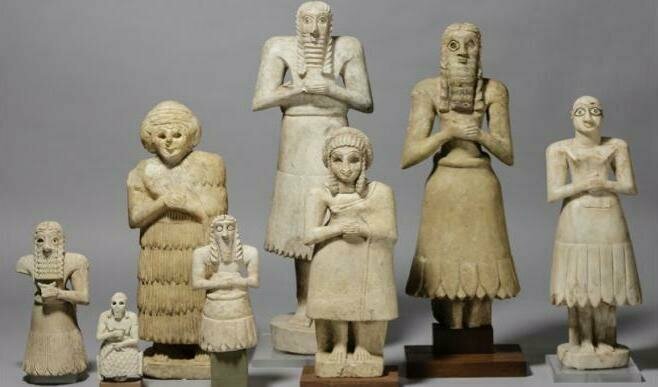 Sumerian votive statues from Tel Asmar (c. 2600 B.C.E. ), depicted with traditional early Mesopotamian clothing. Hands are shown clasped in a typical worship pose. One of the most memorable biblical passages about clothing is that of Joseph and the “coat of many colors.” Joseph, great-grandson of Abraham, was the favored son of the patriarch Jacob, who gave him a multicolored coat as a special gift. A famous Egyptian artistic depiction on the wall of the tomb of Khnumhotep ii, dating to the time of Abraham (1900s b.c.e. 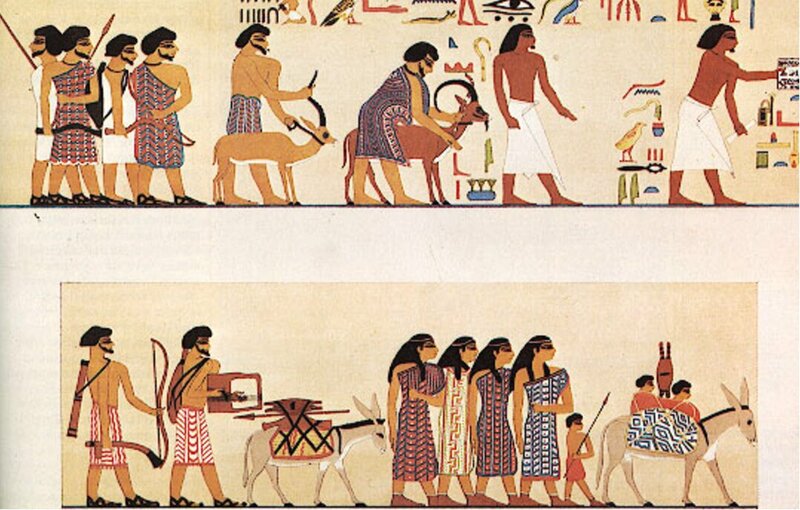 ), shows a procession of Semitic-Asiatic traders entering Egypt. This group is led by a man named Absha, or Abishai, and the scene may even represent a group of Hebrews, or perhaps some other travelers from the east. Several of the party are wearing long, multicolored coats. This clearly shows strong precedence for Joseph’s multicolored coat, quite possibly of the same style (which would have been given to him around a century after this artistic depiction). The Ibscha Relief (c. 1900 B.C.E.) shows Asiatic-Semitic traders visiting Egypt. Again, all members of this eastern party are dressed rather modestly, with men wearing either a short skirt or long tunic and women wearing a full-length outfit, slightly longer at the hem than that of the men. The sandals, of course, were an already long-established part of everyday uniform (also mentioned in relation to Abraham—see Genesis 14:23). Egypt has a rather different story from the rest of ancient Mesopotamia. Clothing was much lighter in the hot, dry environment. Due to their pagan religion, Egyptians rarely wore clothing made from animal products, but instead, almost exclusively used flax. 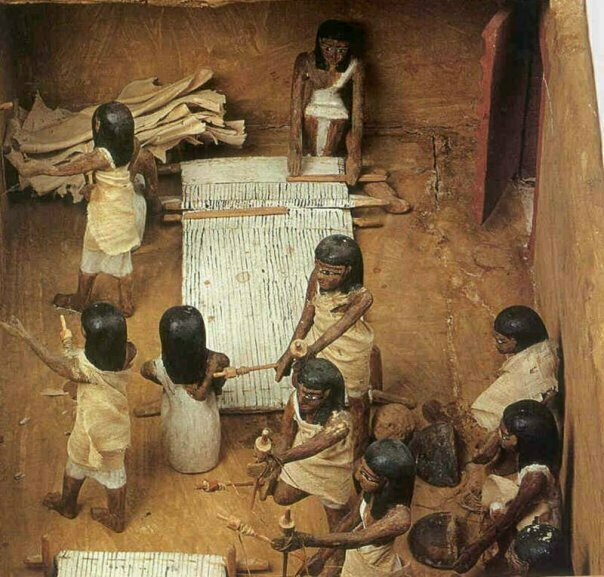 They turned their flax into linen (quite a difficult process). Joshua 2:6 describes flax being laid on a rooftop in Jericho (an Egyptian vassal city), probably to dry before being woven. Animal fibers were not allowed in temple service. The Bible describes the separation of Jacob and his family upon entering Egypt due to their profession as shepherds (Genesis 46:31-34). This was not just due to the use of animals for food, but also for clothing. The Bible states that the seventh plague of hail wiped out Egypt’s crops. This caused not only starvation—the primary concern—but it also collapsed the clothing industry, as the flax was utterly destroyed (Exodus 9:31). A biblical command given to the Israelites who had fled Egypt, found in Deuteronomy 22:11, forbids the mixing together of wool and linen in a garment, implying that animal-based fabrics and plant-based fabrics were not to be mixed together. The reason was to preserve the quality and long-lasting nature of an item—since both types of fabric are very different, it would result in a weak garment when combined. While the Egyptians almost exclusively used plant-based material, it seems there was some small amount of mixing with animal material that occurred. Further, the Egyptian use of plant material as clothing would have been greatly at odds with the original Hebrew animal-based system of clothing—hence the need for the commandment. The image on the right shows an ancient Egyptian funerary-style clay model of a group of women weaving. Unlike other trade jobs, weaving was generally considered a feminine role. This is shown also in Greek art, as well as affirmed in the Bible (e.g. Proverbs 31:13-24). Different forms of clothing existed throughout the different levels of Egyptian hierarchy. Clothing was generally light for the climate and fairly tight-fitting. Men in positions of authority would either wear a full-length outfit or simply a kilt-like skirt, together with the traditional striped-cloth headdress. Wealthy women wore a long, tubelike garment, cut either above or below the breasts. There was little difference between male and female dress among the poorer classes—in general, only a short skirt was worn or, at best for women, a wraparound garment that would partially cover the torso. This was a best-case scenario for slaves in Egypt, including the Israelites. Otherwise, slaves were simply made to work naked. 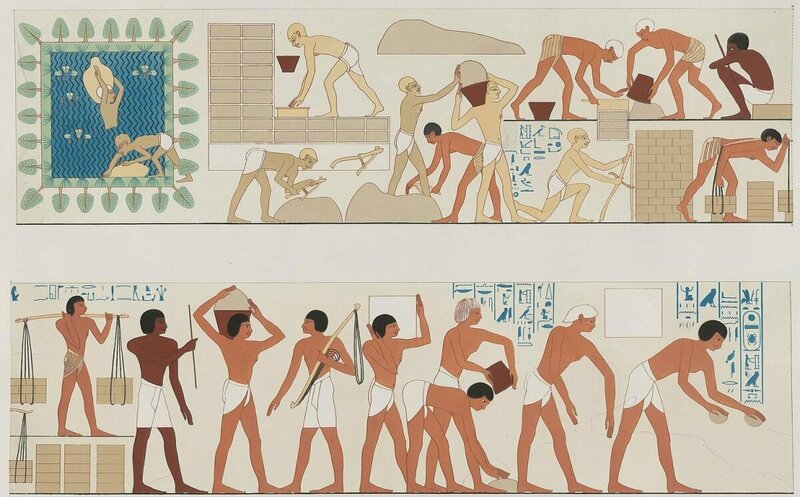 An illustration of the tomb of Rekhmire shows Semitic slaves making bricks. The Bible is quite detailed about the Israelites’ clothing. Typical garb for men included a long shirt-like undergarment, a long outer tunic, and an outer coat. Special long fringes were added to the bottom of the outfit as a reminder to keep God’s commandments (Numbers 15:38-39). A cloth wrapped around the head was another common item. Women wore similarly long clothing in the form of dresses and robes. A veil was also often worn. There is archaeological evidence for these outfits. 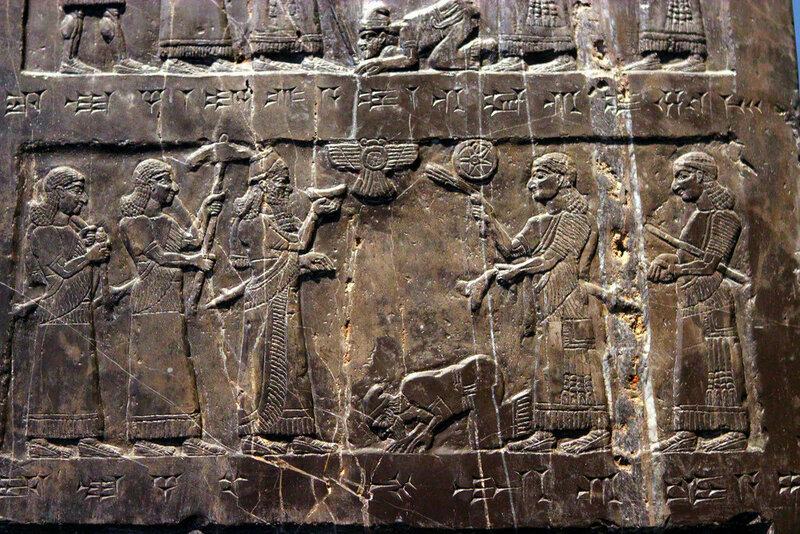 The most helpful is in the form of ancient Assyrian art, depicting subjugated Israelites. The Lachish Reliefs depict the massive Assyrian campaign against Lachish by Sennacherib (as described in 2 Kings 18, 2 Chronicles 32, Isaiah 37 and Sennacherib’s annals). Conquered Israelites are shown being paraded, with men in either long tunics or with their garments “girded up” to a kilt length, with beards and short-cropped hair (as opposed to the long hair of the Assyrian men) or wearing a head-wrap. Women are shown in longer, loose, ankle-length dresses or tunics, wearing veils that reach from the head to the ankle. Children wore smaller versions of the outfits corresponding to their respective gender. The Black Obelisk: A kneeling King Jehu of Israel presents tribute to Shalmaneser II of Assyria. The Black Obelisk, a victory stele of Assyrian King Shalmaneser iii, has a depiction of tribute being offered by King Jehu of Israel. The man depicted on the stele kneeling before Shalmaneser is almost certainly Jehu himself—making this the first and only known depiction of an Israelite king. He wears a long, ankle-length, short-sleeved tunic and a soft cap—possibly worn as a sign of humility. Even evidence of the use of “fringes” on the borders of garments has been found, mentioned on ancient documents and in artwork dating back to around 4,000 years ago. This fine wool textile, dyed red and blue, was found at Timna. The textile used the various colors of natural animal hair to create black and orange-brown colors for decorative bands. Archaeological excavations completed at the Timna mines (southern Israel, within what was the ancient territory of Edom), have provided evidence that they were controlled, as the Bible states, from Jerusalem during the time that kings David and Solomon were on the throne. The massive amount of copper mined (evidenced by the dated abundance of slag) would have been crucial for the building of Solomon’s temple. 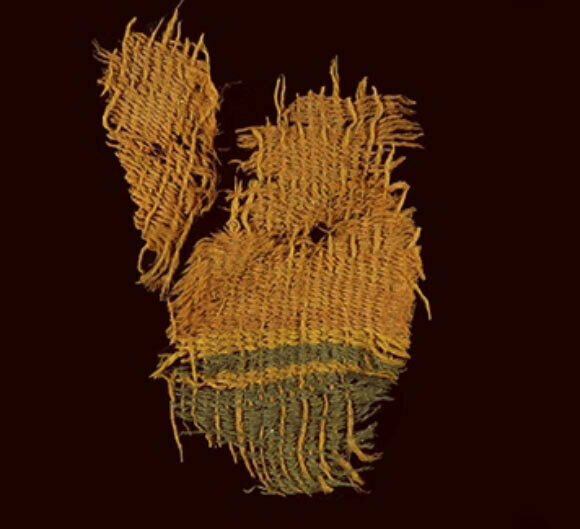 Among other discoveries dating to Solomon’s time are several beautifully preserved, colorful fragments of woven woolen fabric. The blue-and-red-striped fabric surprised scientists, who had not expected to find such quality clothing in a mining environment, where slave labor was expected. The items help affirm the sheer wealth described of Solomon’s kingdom in the Bible. The Bible often describes the use of red and blue dyes, and even mentions a personal request by King Solomon himself for a skilled man who can work in “crimson and blue yarn” (2 Chronicles 2:7). We now take a brief step back in the biblical record to mention one biblical family, descended from Cain, which brought about rapid development in various fields to the early antediluvian world—albeit for the wrong reasons. Lamech, the great-great-great-grandson of Cain, was father to sons Jabal, Jubal, Tubalcain, and daughter, Naamah (Genesis 4:19-24). Jabal was a pioneering nomad and leader in the worship of cattle. Jubal was a pioneer in perverted music. Tubalcain was a pioneer in blacksmithing and metalworking, specifically in producing weapons for war. Their sister Naamah isn’t specifically listed by profession, but there are some hints that she was a pioneer in the fashion industry. Some insight comes in comparing the early biblical figures to those of Greek history. To the ancient Greeks, a goddess named Gaia was considered the mother of all life. This name is believed to be a pre-Greek word, meaning “Earth” or “life.” Gaia, of course, immediately comes across as an Eve type. Eve’s name in Hebrew is Chavah, also related directly to the Hebrew name Chaia, both symbolizing “life.” In fact, the words Gaia and Chaia properly pronounced are very similar. 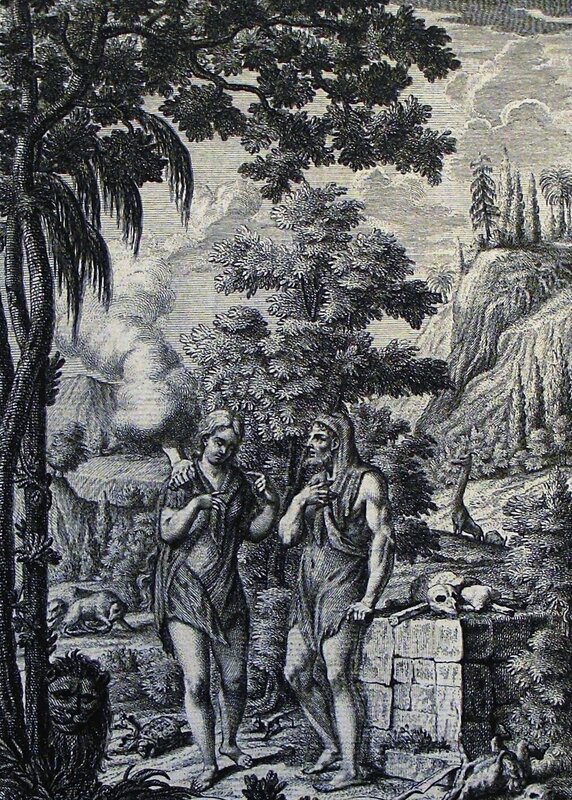 Gaia’s child Cronus, whom she bore with the first “father” god Ouranus, was the patron of the harvest and is symbolized by the sickle and grain. Interestingly, Adam and Eve’s son Cain was likewise known as a “tiller of the ground”—a crop farmer (Genesis 4:2-3). 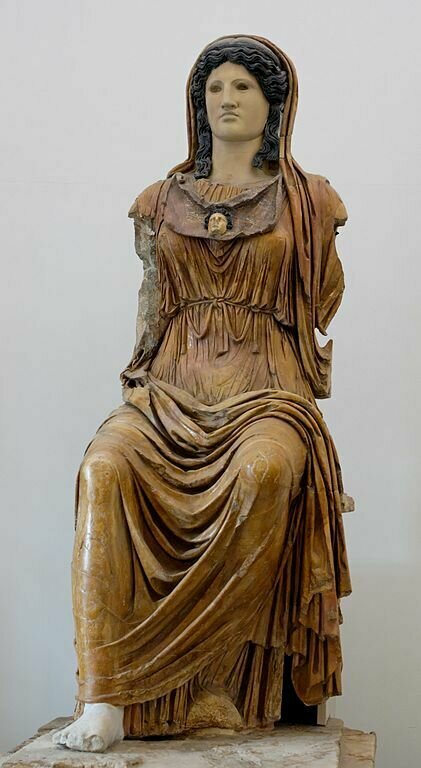 Statue of Athena, from the Piazza dell’ Emporio (Rome); late first century B.C.E. to early first century C.E. Some throw away the biblical account as being too unbelievable, too incredible, too unlikely. But in reading and comparing the above paragraphs on the evolutionary road versus the biblical road to clothing and shame, we find that precisely the same could be said about the evolutionary account—a number of unsupported fantastical theories, claims, ideas that actually require just as much (if not more) religious faith to believe than the Bible. The evolutionary theory only opens up more questions, without providing any definitive answers. The biblical claims, however, are given definitively and authoritatively—and align closely with the material discoveries (excuse the pun) that have been made. If the Bible has proved accurate about the early clothing methods of the ancients, couldn’t it also be accurate about the genesis of clothing, as well as of shame? It’s amazing that even the history of clothing helps prove the veracity of the biblical account. Not least of which the fact that clothing, and shame, are found across all cultures. Together with other common cultural universals (such as marriage and language, as described in earlier articles in this series), the case surely has to be made that mankind started off as a small, connected, core group of humans that dispersed around the world, all taking common traits and cultural elements with them. Together with these common cultural elements, common stories were also carried by the migrating ancients to all corners of the world, including parallel stories of creation, a great Flood, and a tower of Babel and confusion of languages. Even these stories could almost be called “cultural universals” since they are so commonly found throughout diverse cultures and histories. Common ideas and common traits point to a common experience—one that only the Bible provides an answer for, not evolution. For more information about the events that took place in the Garden of Eden surrounding the original sin, and its follow-on effects (not just shame) to this very day, read our free booklet Mystery of the Two Trees. And for more information on the veracity of the Bible and to prove it for yourself, read our free booklet The Proof of the Bible, by Herbert W. Armstrong.